A mega shark that lived 300 million years ago would have made today's great whites look like shrimps, according to fossils of the beast unearthed in Jacksboro, Texas. Supershark's ancient age makes it a prize find, indicating that giant sharks go back much further in the fossil record than previously thought, the researchers said. They presented their unpublished findings Friday at the 75th annual Society of Vertebrate Paleontology conference, in Dallas, Texas. When supershark was alive, during the Carboniferous period, a shallow sea called the Western Interior Seaway covered Texas and much of the American West. 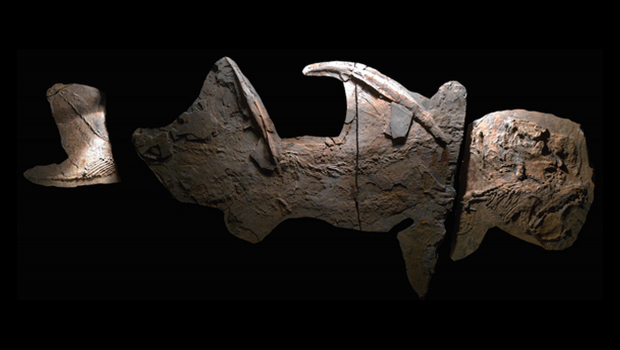 The fossil remains of the sea's marine life are still being uncovered in the ancient seabed, which is how study co-author Robert Williams, of the Dallas Paleontological Society, discovered the larger of two partial supershark fossil braincases. Another collector found a number of large and pointy, fossilized shark teeth, but it's unclear whether these belonged to the Texas supershark or to another ancient species, the researchers said. The braincases, which comprise the back end of the sharks' skulls, resemble the corresponding skull parts of other Paleozoic fossil sharks, but "are clearly different from the far shorter" back skull regions of modern sharks, the researchers said. To calculate the body size of the supershark without a complete specimen, lead researcher John Maisey, a curator of vertebrate paleontology who specializes in fossil fishes at the American Museum of Natural History in New York City, and his colleagues had to get creative. So they looked to the dimensions of other complete specimens of ancient sharks known as ctenacanthiforms, which are a group of ancient sharks that lived during the Carboniferous period (It's likely supershark is also a ctenacanthiform, but its true identity will emerge only once other supershark remains, such as teeth and fin spines, are found, the researchers said.) The skulls of these ctenacanthiforms accounted for roughly 10 percent of the sharks' entire body length, the researchers found. If the Texas supershark shared the same proportions, its roughly 31.5-inches-long (80 centimeters) skull suggests that its body was likely more than 26 feet long, Maisey said. The other supershark they discovered likely measured about 18 feet (5.5 m), Maisey said. The conference held another gem for shark enthusiasts. During a dig in a New Mexico quarry, John-Paul Hodnett, a graduate student of biology at Saint Joseph's University in Philadelphia, discovered a nearly complete fossilized shark that also dates to about 300 million years ago. The specimen, a female, measures about 0.6 feet (2 m) long and sports teeth that "are actually brand-new to science," Hodnett told Live Science. "We've never seen this type of tooth before." He plans to analyze the teeth in an upcoming study, he added. That fossil is so complete that studying it may help researchers better describe ctenacanths, a group of ancient sharks, he said. "There's a lot of missing data," Hodnett said. "My advisor is always saying if you can't find data, go out digging."